Adir 4-pc. King Bedroom Set For an on-trend bedroom, look to the Adir 4-piece king bedroom set. This stylishly contemporary collection features sleek design elements like plank board lines and nickel finished drawer pulls that draw subtle attention. The dark gray pine wood in rectangular design looks absolutely stunning. Plus, Adir is equipped with the convenience of two USB charging ports, a light in the nightstand and a reading light in the headboard. For an on-trend bedroom, look to the Adir 4-piece king bedroom set. This stylishly contemporary collection features sleek design elements like plank board lines and nickel finished drawer pulls that draw subtle attention. The dark gray pine wood in rectangular design looks absolutely stunning. Plus, Adir is equipped with the convenience of two USB charging ports, a light in the nightstand and a reading light in the headboard. this bedroom set is beautiful love the color and style but the color fades very easily to the touch. I’ve had to touch up several parts of the dresser already and only had this furniture for a week now. Not sure how long this will stand up to the very day wear and tear but let’s hope for the best. What a difference a beautiful bed set makes to a room! The set is beautiful and very sturdy! We love it! We feel like grown ups finally!! We love it. Looks great. Very sturdy and large drawers. Great looking solid wood well built and sturdy. We love it. I love this bed set I bought it over a year ago. Looks great, delivery and set up was flawless. I absolutely love this. The set in grey is just beautiful. Everything came on time and in perfect condition. It was set up quickly and I'm simply very happy with the purchase. Only down side is the switch for the light is on my side of the bed so I have to turn it off (I'm little and it's not the easiest thing to reach). Could you explain "the color fades" and "had to touch up several parts"? BEST ANSWER: I do not have any discoloration on my set, I just wipe mine with a dry fiber towel. Maybe if you use chemicals that could cause discoloration. 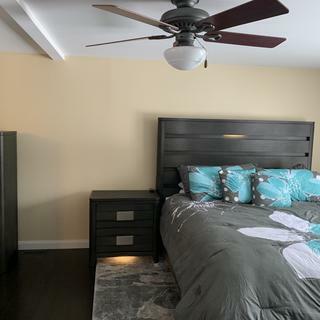 The color fades are a nice touch to this beautiful king size bedroom set , I would recommend a similar wood finish for touch up, you should be able to get the color at a lowes or home depot, if not contact the warranty department of raymour and flanigan. The color still the same since we bought it about 6 months ago. Has not faded. We did not have any issues with color fading. Can this bed accept an adjustable frame and mattress? BEST ANSWER: Yes, the Adir King Bed is compatible with an adjustable base. Yes that is how we have it set up!! !